There is a lot happening off late on multiple fronts (when is there not!). There is something new that's going to happen to the blog in the next 15 days and I am quite excited about it. So stay tuned for that. I have also been busy updating the blog for a travel section which will now be a regular feature as well. After all, where there is travel, there is good food (and we go hunting for it). Now that I have set up all the perfect excuses for being a bit behind on some interesting food experiences I have had with friends and family, here is a place I completely loved and have been to twice recently. My first visit to The Open Box was on work. I in fact, worked on a story for CW Interiors on the decor of this massive space. A story well worth doing because there are several elements that have gone into the creation of this space, each of them adding to the space aesthetically and practically - think swinging bucket seats, community tables, spaces for the solo diner and you must check out The Garage for those corporate breakouts! The first visit was more work and quick eating, while the second was with family, much more leisurely and satisfying. 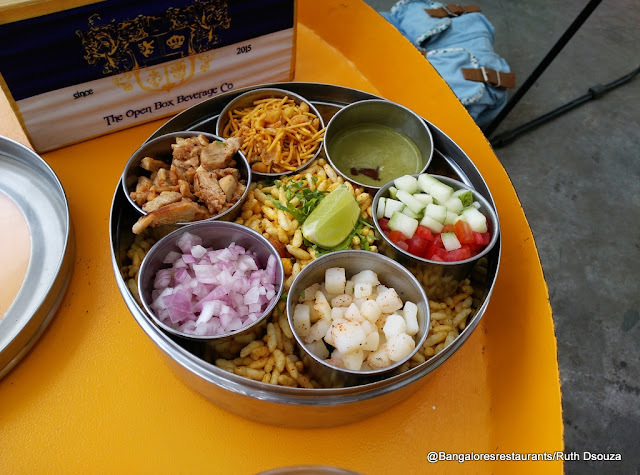 The food at The Open Box offers a range of 'chakna', 'touchings', 'bar snacks', 'snack snacks' for those looking for long languorous meals with your drinks. It moves on to substantial mains for those you may want to pack it in over lunch with a friend, or a business meeting. Such a menu works great if you are looking for souped up cafe grub or a good hearty meal. 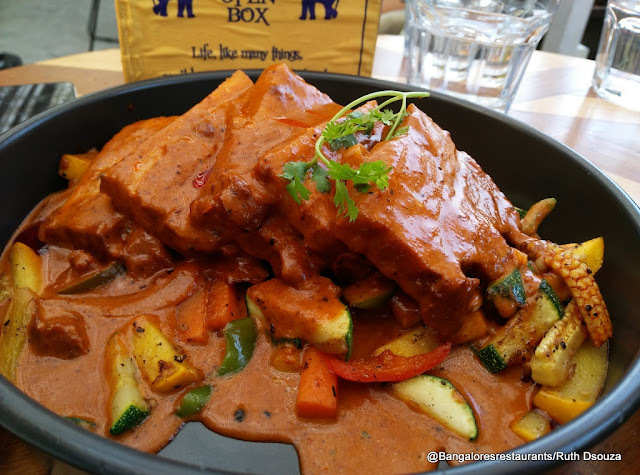 The Open Box takes a number of popular international and Indian dishes, making interesting exchanges between the two, in terms of flavour profiles, presentation and creating something that will have you stop a conversation couple of times to appreciate. We can never say no to something that has coconut water as the base. I personally think its a great base to start with and can be enhanced with a range of alcohol, giving it great texture and a sweet flavour profile. 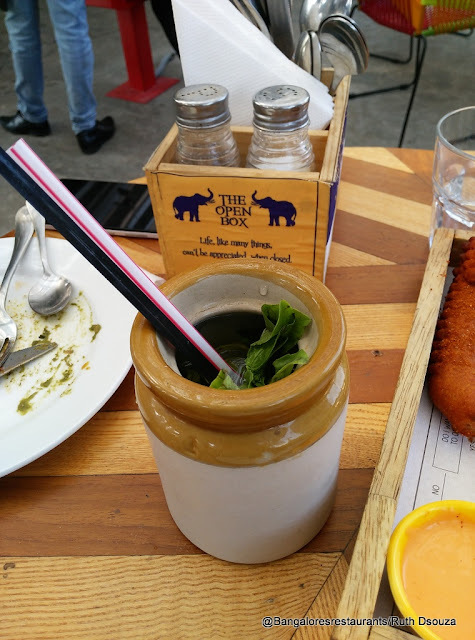 This Piyakad Nariyal has coconut water, gin, basil and mint muddled into it and is served in a pickling jar. Makes for a nice in-between drink if you plan to have a long evening or afternoon. For those who prefer the classic non-experimentive stuff, all of the good cocktails and branded liquor are available. 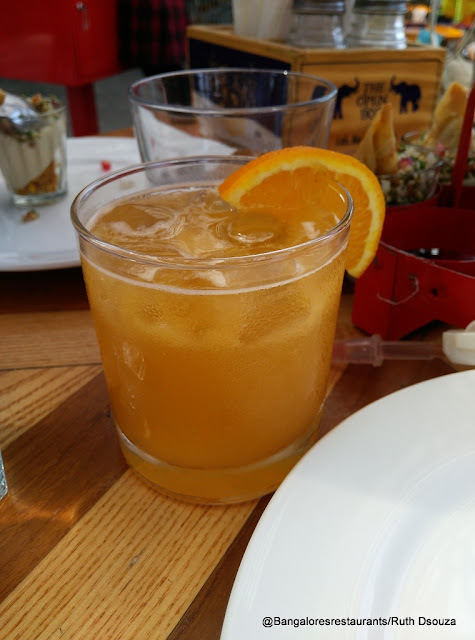 Sudhakar enjoyed his Whiskey Sour, which is available as a single drink and as a pitcher. 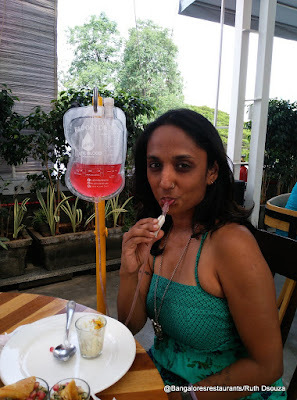 I also did one their gimmicky drinks, The Drip-Me-Tight, which is served to you in a drip bag on a stand. Into your mouth goes the drip chamber and you use the thumb wheel to regulate the flow into your mouth. Can be a little sticky mess till you get the hang of it, but the drink is potent and was most welcome on the afternoon we went there, after being stuck in 1.5 hour long traffic for a 6km distance. Phirangi Paani- Paani Puris stuffed with spiced potato (which I personally prefer over the chana filling). Alongside comes a cocktail shaker filled with a cold avocado soup, which is thin enough to replicate the traditional paani. It is packed with spicy and a tangy component that gives it some amazing zing. Pour a bit into the puris, eat up and then drink up. Once done with the puris I did shots of the paani, till it was all gone. For someone like me who loves tangy immensely, this is a dish I remembered late into the night. All the trappings of a Chicken Bhel Puri served in a traditional spice dabba. Throw in all the ingredients into the spiced puffed rice, shake it up and you have a rather filling snack. 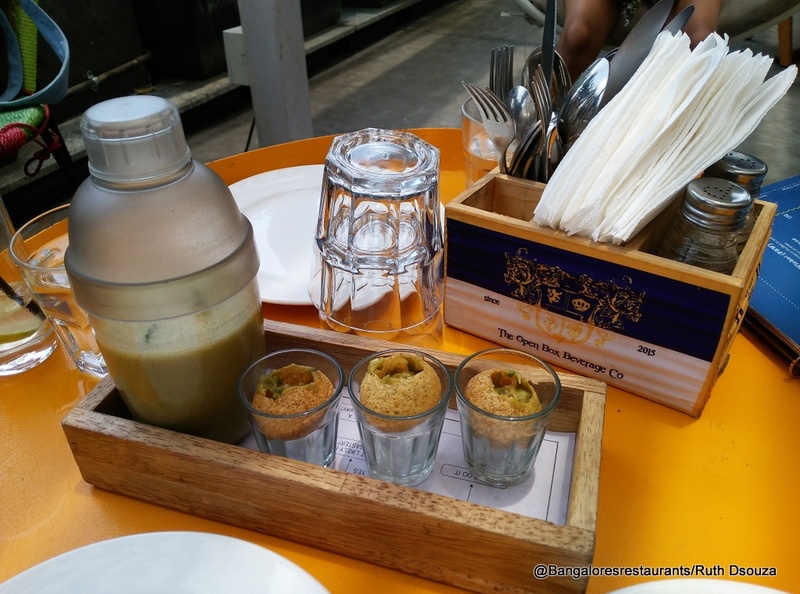 Hummosa - Mini paneer stuffed samosas are split in half and placed on a layer creamy hummus in a chai cup. Around this is sprinkled some tabbouleh and the end result is quite pleasant. 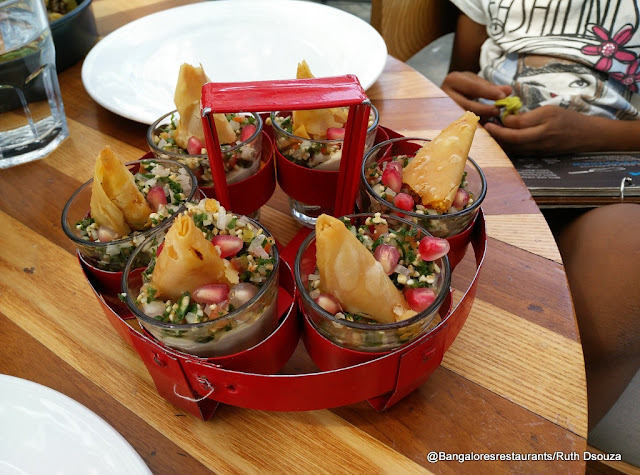 The crispy of the samosa pairs well with the crunchy freshly tossed tabbouleh and of course, when the hummus is good, nothing beats that right? Tunday on Toast - Lamb cutlets on crispy toast with some yogurt-mint chutney. Good cutlet as far as the finely minced meat goes, but this one didn't work too well for me because of the strong dusting of what tasted like an improvised chaat masala that coated the mouth and left no room for the moistness of the cutlet to come through. Very generous in terms of portion size, I would say this is best shared by at least three people if you want to try out more on the menu. 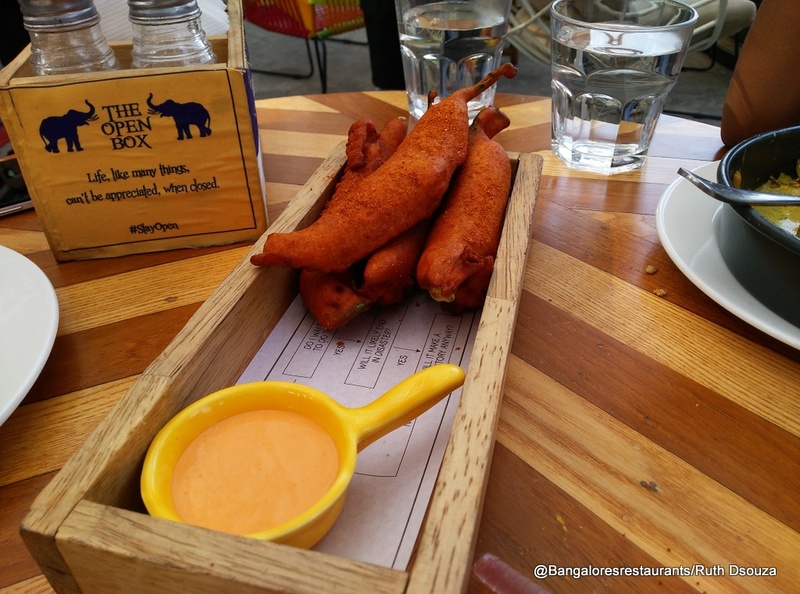 Meri Chilli Teri Toast - Salan chillis stuffed with cheese, batter coated and deep fried, with the milder dusting of the early mentioned masala powder, with a cheesy dip. This one hits the spot beautifully- crispy, spicy, gooey cheese. Do be careful of that first bite, cheese can be deceptively steaming hot. Biryani 65 - Now, as much as I love experimenting with food, the comfort of a good biryani (and I ain't no biryani snob -region, style, ingredients matter not to me. If it tastes good, I am a sucker for it) is eternal. This one comes in a little pressure cooker, that can be a little difficult to maneuver over a full table, nevertheless, it is what is inside that matters the most. The quantity is good for 2 good eaters and the crisps at the side keep everyone happy. Fettusuey - When Fettucine pasta and khowsuey come together you have this cracker of a dish (yes Masterchef hangover! Sue me!) Anoushka loved the dish and had it on both visits, in chicken. 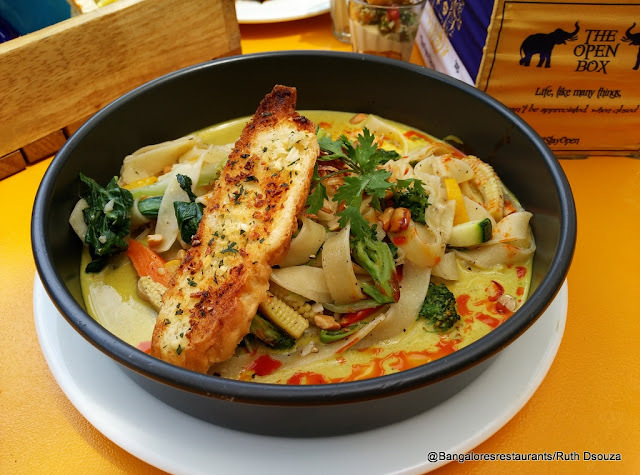 An amazing broth of flavorful coconut milk, crunchy vegetables and the varied garnishing of peanuts, chilli oil, coriander and caramelized onions. 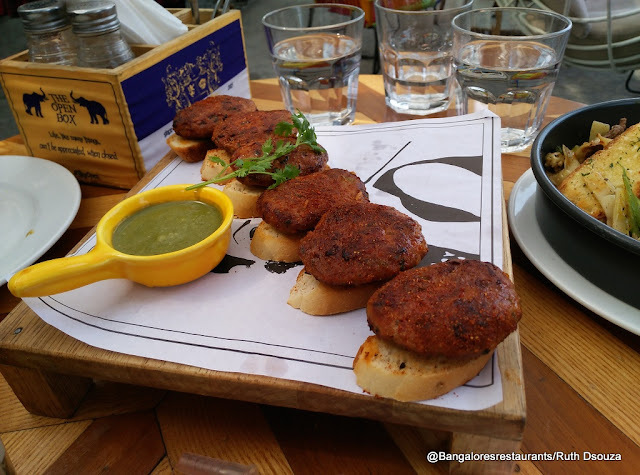 A very comforting dish that the current weather in Bangalore begs for. I honest to God did not think Pork Belly Chettinad could ever be a thing, but it is... and what a thing of beauty it is. Thick slices of pork belly with a great meat to fat ratio, smothered in a Chettinad curry that packs a good punch of pepper and with crunchy veggies thrown in - this can be a meal for one especially if you are always looking for a way to thank porcine Gods for the creativity they bestow on chefs. On both occasions desserts did not really happen because of the lack of tummy real estate. There is a lot left unexplored on the menu that I would like to go back for. Service was good despite being almost a housefull. I personally found the colourful string back chairs in the cafe area a little unbalanced to sit on and the tables there a bit low for comfort, but the second time round, regular chairs and tables did the trick. 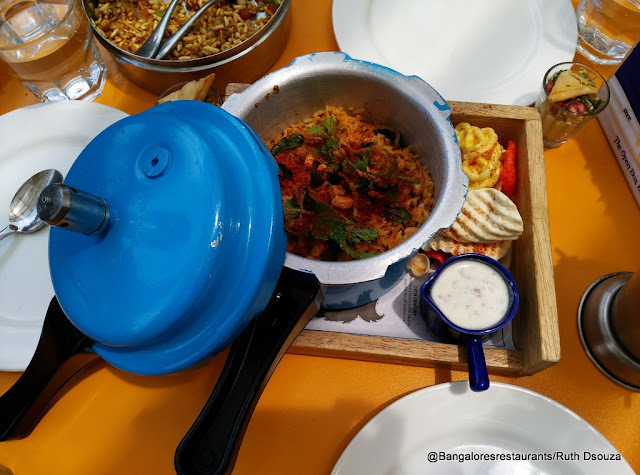 A meal for two is in the Rs 2200 + taxes category which is absolutely great for the space and the portions. The loos are clean and are entertaining in terms of decor too.